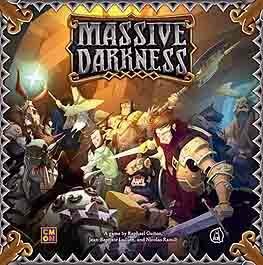 MASSIVE DARKNESS IS A COOPERATIVE GAME OF DUNGEON CRAWLING FOR 1 TO 6 PLAYERS, AGES 14 AND UP. Will you play a tough Dwarf, a cool Elf, or a stalwart Human? Will you choose a career as a battle wizard, a nightshade ranger, or a shadow barbarian? Gather your friends, build your party up, and delve down into Massive Darkness! Explore the dungeon, upgrade your hero with experience and magic weapons, and face hordes of awesome miniatures. No need for a game master: everyone plays on the same team, while enemies are controlled by the game itself using simple rules. A new war is about to begin! Three generations ago, glorious heroes called Lightbringers drove away the Darkness, the will of evil, and its armies. For years, evil Dwarves, Goblins, and Orcs patiently awaited for revenge. The time has come! Our enemies of old are taking arms at the Darkness' command. Hiding away in remote caves and abandoned dungeons, they stole the atefacts of the Lightbringers and made pacts with savage monsters. The nightmarish horde will put an end to civilisation unless a new generation of heroes stands up. This quest is yours. Draw your sword, ready your spells, and claim your legacy by facing...Massive Darkness!